…[Lower leeson Street minutes ago] parked up and taking pictures of themselves…. If you are sick of these posters and the tactics of Youth Defence. You may want to tell them tomorrow at 6pm. details here. 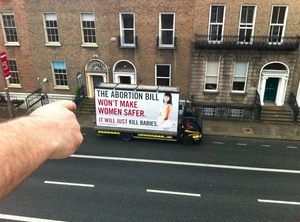 Posted in Misc and tagged Pro-Life at 11:50 am on June 27, 2013 by Broadsheet.